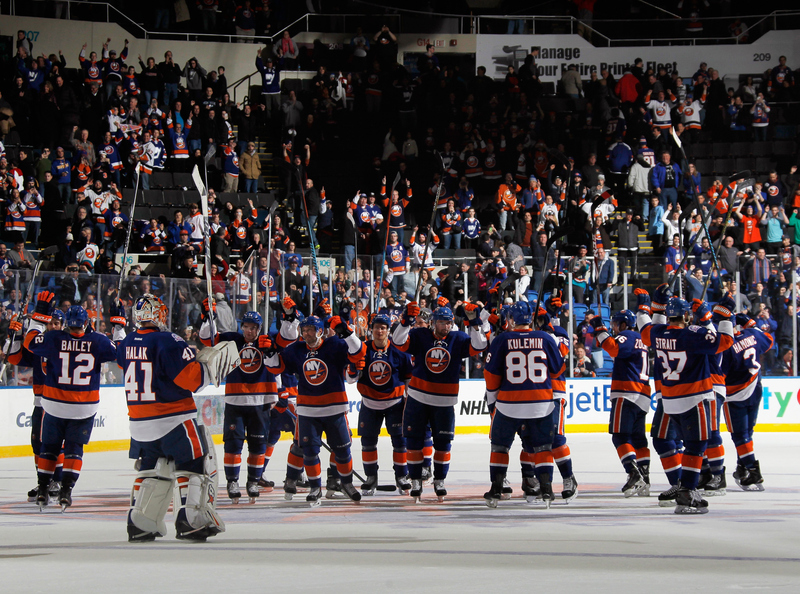 The New York Islander wrapped up The Nassau Veterans Memorial Coliseum with their best season since the 1983-84 Isles. They finished with 101 points as the 5th seed in the Eastern Conference. The Isles matched up with Alex Ovechkin and the Capitals in the first round of last year’s postseason. The Isles took the Caps to seven games. This series pitted former Capitals goalie Jaroslav Halak vs. young gun Braden Holtby. The great goalie matchup forced both teams to fight for each and every goal. Capitals’ second line mates Marcus Johansson and Evgeny Kuznetsov both had great series, scoring 13 points in the playoffs combined. Nonetheless, the Isles played the Caps tough, despite the disappointing finish. The Isles did have a great season. Captain John Tavares fought for the Art Ross Trophy, losing the scoring lead to Jamie Benn after a wild four point night in his final game of the season. In addition to the great scoring season, Tavares became more of a leader in the Islanders clubhouse, helping prospects Ryan Strome, Brock Nelson and Anders Lee settle into the NHL. Tavares specifically showed excellent chemistry with Strome, playing on the same power play and line for a decent stretch of the season. Another big storyline from last season was the effectiveness of the Isles fourth line of Cal Clutterbuck, Matt Martin and Casey Cizikas. Martin, the league leader in hits last season with 382, boasts the physical strength and toughness needed to stop opposing number one lines. Clutterbuck and Cizikas are gritty and therefore, annoying to opposing skill players. The fourth line or the “boom line” were a force to be reckoned with for the Isles last season. This offseason, the Islanders were very conservative. Backup goalie and defensive depth seemed to be the biggest hole for the Islanders. Early in the offseason, Garth Snow signed Thomas Greiss from the Penguins to the man the crease behind Jaro Halak. It seems that Greiss is an obvious upgrade over last year’s combination of Chad Johnson and Michael Neuvrith. The Isles also re-signed defenseman Thomas Hickey in order to retain some of their depth. Last postseason, the Islanders’ defenseman were hit by the injury bug and had to rely on rookies Griffin Reinhart and Scott Mayfield. These guys were not ready for the Stanley Cup Playoffs and it showed. Nonetheless, the Isles have not signed any new defenseman, despite being rumored to have interest in Merek Zidlicky and Lubomir Visnovsky. Garth Snow made some shocking decisions during the draft this offseason. Snow continued to add to the richprospect pool by making multiple trades. With no first round picks, Isles fans didn’t expect much from the club. Snow turned Griffin Reinhart and some other picks into two first round picks. At 16, the Isles drafted Matthew Barzal, a 6’0″ forward who had 57 points in 44 games in the WHL. If it weren’t for a knee injury, Barzal would have been selected in the top 10. The Islanders made another aggressive move, trading up from 33 to take Anthony Beauvillier with the 28th pick. The Isles added two top 100 prospects within a span of 45 minutes to their already talented prospect pool. Things are going to be different this year for the Isles as they transition into their new building in King’s County. Many have been concerned that the Islanders would be changed by their Bruce Ratner and Brett Yormark. The fans hope that the Islanders move forward with the traditional orange, white and blue color scheme and the original logo. Yormark has put all of the rumors aside by promising that the main uniforms will stay the same; however, he has claimed that there will be a third jersey with the Nets black and white scheme. This supposed jersey has been leaked, and it doesn’t look pretty; however, we shouldn’t complain because the Islanders could realistically have been playing next season in Quebec or Kansas City. Barclays Center is a beautiful, state of the art arena that was solely designed for basketball and concerts/shows. The owners of the arena asked Islanders owner Charles Wang if he wanted to move into Barclays Center, but Wang, who was confident in The Lighthouse Project, wanted to keep the team on Long Island. Therefore, the arena will look a little strange. For example, the scoreboard hangs directly to the right of center ice. It looks a little ridiculous, but after a while we will all get over it. The Islanders future is super bright. With 6 prospects in the top 100, the Islanders are set up to break in the new building with a ton of wins. John Tavares should continue to be a star and a leader as the Isles fight for cup number 5. Once we get used to the fact that Nassau Coliseum is closed for hockey, we will all get used to watching hockey in our new home. This entry was posted on May 21, 2015 by Dylan Bernstein in Analysis, NHL, Uncategorized and tagged brooklyn, Charles Wang, Drive For 5, Garth Snow, Hello Brooklyn, Islanders, john tavares, Ryan Strome, YES Chant.